Siracha Chilli Sauce is a staple for my sil, so since he likes it so much, i used it for these wings and for sure he loved them. Wash out the bowl. Add the Sriracha, butter, cilantro, lime zest and juice. If properly done, these shrimp balls are crispy on the outside, moist and crunchy inside. 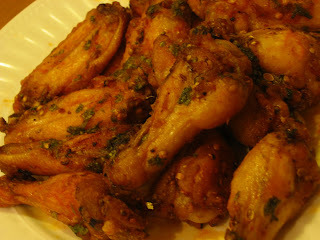 They are good party finger food and will be the topic for conversation at the party. Shell, devein, and rinse shrimp. Drain thoroughly and wipe very dry with kitchen towel. Add shrimp, and seasonings to a food processor, using the metal blade, process for a few seconds, until shrimp is pasty. Shape shrimp mixture into 1-inch balls. Place drop them into the cubed white bread. Roll and press to adhere the bread. Heat oil in a wok to 375 °F and drop shrimp balls into hot oil carefully. 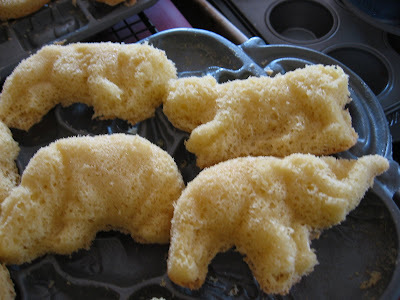 Deep-fry until golden brown. There are many ways to cook this dish but the end result is equally good. Some like it with more sauce and some like thicker sauce and there is no fast rule as how it should be, just how you and your family like it. This recipe is one of the easiest way to cook this pork. Combine star anise, dark and light soya sauce, peppercorns and water and bring to the boil. Add in pork and let pork cook in sauce for 10 minutes before adding the garlic cloves. 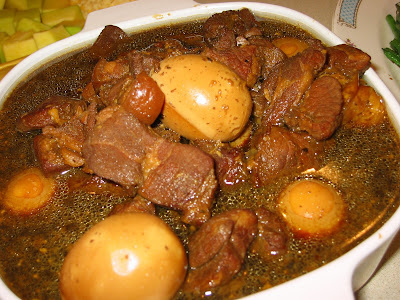 Hard boil eggs can be added to this dish and this dish is best eaten the next day to allow its flavors to develop. 'Tako' the Japanese word for 'octupus' and 'Yaki' for 'grill. so, if no octupus is used, can this be qualiflied as 'Takoyaki'? I used thick squid to try out this recipe and to play with this pan. If these balls were not accepted with enthusiasm, it will be alright, at least there was not a dent in the pocket - paying for the expensive octupus - the squid was only 99 cents/lb. Surprising, everyone who ate them liked them except me, i liked the batter to be more like pancake rather than this which was like the 'kuih' or pudding texture. Perhaps i chose the wrong recipe but anyway it was a very enjoyable effort flipping the balls. 2. Cut the konbu into 2-centimeter-wide partial strips against the grain, but don't cut all the way to the edge . 4. Just before the water starts to boil, remove the konbu from the pot. The liquid should be a light yellowish or greenish color. 7. Quickly remove the shaved katsuobushi from the liquid with a filter or strainer or cloth. Try to remove the katsuobushi while it's still floating on the surface, before it has a chance to sink. 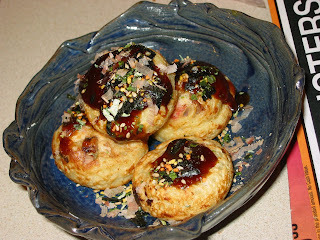 Make a small test batch of 4 or 5 takoyaki at first, to check the consistency of the batter. Add more flour or water as needed. 5. 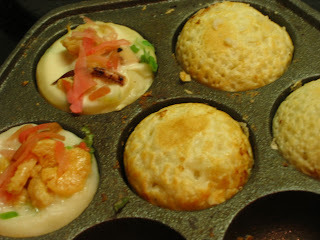 Cook the takoyaki pieces until they achieve the desired degree of firmness, turning them over frequently. What a colorful dish this was, the purple and orange cauliflowers together with the coral broccoli which is green, created a kaleidoscope. The texture and taste of the cauliflowers are the same as the usual white cauliflower but the green coral broccoli is very tender and sweet. The recipe is the same as Mix vegetables chicken stir-fry. Replace the vegetables with cauliflowers and broccoli. Prepare the turkey gravy and the stuffing/dressing and leave in the fridge until needed. This is the most popular recipe for steaming fish in the Teochew repertoire. The perfect combination of the ingredients create its very own flavors which enhanced the smoothness of the pomfret. 1. Wash fish and pat dry. Make a few slits on each side of the fish. Rub lightly on the surface and inside of fish with salt, pepper and corn starch. Then stuff a few shreds of ginger and spring onions into the slits and fish stomach. 2. Heat up 1-2 tbsp oil. Add in the rest of the shredded ginger, pork and mushrooms and stir fry until fragrant. 3. Arrange fish on a steaming tray, arrange toppings over fish and pour mixture from (2) over the fish. 4. Steam over high heat for 12-15 minutes or until cooked. Garnish with shredded spring onions and chilli. Note: - when the eyes of the fish has popped out, this is an indication that the fish is cooked. The turkey should be defrosted - follow the instructions on how to brine, truss and then leave the turkey, uncovered for a vacation - cold drying in the fridge. While turkey is on vacation, the less fortunate relative - the neck, giblets etc will be taking a hot vacation - they are to be roasted for the gravy. The stuffing can be prepared today too or if it is too much, prepare the stuffing tomorrow. This time is little Julianna's 2 year party and the theme was Minnie Mouse. Luckily, i was able to borrow a Mickey Mouse and it was Mickey on Parade. Well that was not a, problem, just cut away the hat and added eye lashes , top with a big red polka dot ribbon and viola - it's Minnie. 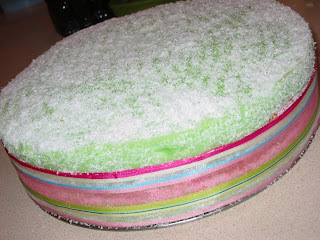 Follow the recipe for Pandan Chiffon Cake except change the pandan flavor to whatever flavor you desire. I used Raspberry and a tinge of red to make the cake pink. 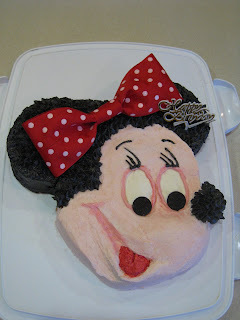 A Mickey Mouse Pan was used to mould the shape of the cake. The turkey is defrosting in the fridge. Nothing much can be done except let the poor bird thaw in peace. What's for dessert? - Decided to make a pie, any pie, perhaps these classics Sweet Potato Pecan Pie or French Apple Tart. Start making the pie/tart crust today and leave in the fridge until required. Scones with clotted cream and strawberry jam create an oasis of pleasure when you enjoy them with a cup of tea. 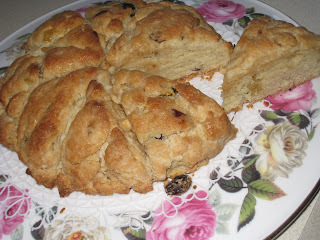 Scones are best eaten the day they are baked, they will still be good on day two or three, but there is no ignoring the fact that they do start to dry out by then. To prolong their freshness, brush with the honey-butter glaze and they will stay wonderfully moist and flavorful for a good four days. Scones are undoubtedly British in heritage and i am glad that they brought these scones to the Commonwealth and into my kitchen now. When we celebrated Kevin's birthday, we had a small tea party for him as he is at the moment not eating meat otherwise like the years before, he would love to have a steak dinner. In a 1 cup measuring cup, put lime/lemon juice in and top up with whipping cream to 1 cup mark and let stand to make soured cream. In a food processor, add flour, sugar, salt, baking powder and baking soda and pulse briefly to blend. Add in butter and pulse to make a coarse, grainy mixture. Turn mixture into a large bowl and make a well in the center. Beat egg lightly with vanilla , and add to flour mixture together with soured cream and mixed fruit to form a soft but firm dough. Stack 2 baking sheets together and line top sheet with parchment paper or silicone pad. Divide dough into 3, and remove 1 portion of it to place on to parchment paper or silicone pad. Press the dough into a 6 inch disk about 1 inch thick and score into 8 piece wedges. Brush the top with milk or melted butter. Repeat with the other 2 portions. 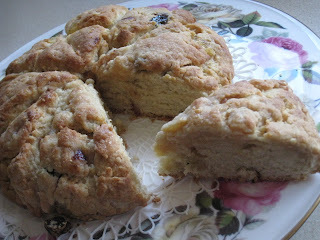 Bake until scones are nicely browned about 16 - 19 minutes. I like to bake the scones one tray at a time, cos it takes such a short while to cook, and by the time, these first 8 wedges are eaten, the next tray will be ready for the table. Meanwhile, prepare the glaze by heating the honey and butter in a microwave until the mixture is just simmering about 1 1/2 minutes at high, stirring after 45 seconds. 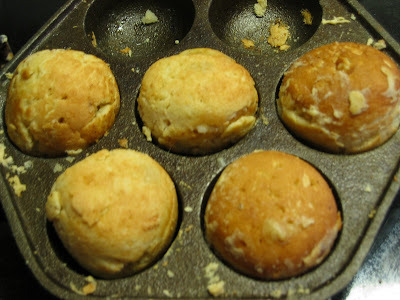 Brush scones lightly with honey-butter glaze as they come out of the oven. Let stand on baking sheets for 15 minutes and then repeat brushing with more honey-butter glaze. 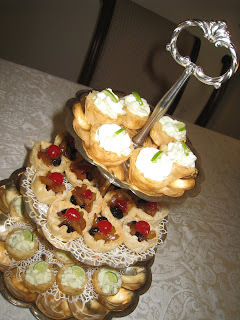 These tartlets were also served in the tea party and recipes will be posted shortly. Please do come back to check for these delectable tartlets. 5 days to Thanksgiving - buy the turkey and leave in the fridge to defrost. You might want to read this High Roast Turkey and check out the sides and desserts in this blog - get all the ingredients required. Why is a Denver omelette called a Denver omelette if no parts of Colorado are actually in the filling? Yet another mystery of life. Have to make this omelette for breakfast today to commemorate Denver's 150th year today - HAPPY BIRTHDAY - 5280 @ 150. Perhaps these numbers will be lucky for 4 ekor fans in Malaysia and Singapore. Heat butter in 8-inch omelette pan or skillet over medium-high heat just until butter begins to brown. As butter melts, tilt pan to coat bottom. Cook ham, bell pepper and onion in butter, stirring frequently. Tilt pan and run spatula under edge of omelette, then jerk pan sharply to loosen eggs from bottom of pan. Fold portion of omelette nearest you just to center. (Allow for portion of omelette to slide up side of pan.) Turn omelette onto warm plate, flipping folded portion of omelette over so it rolls over the bottom. Tuck sides of omelet under if necessary. 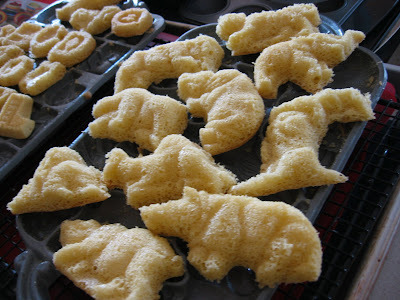 When i was in Malaysia, i hated the Kuih Bahulu, not that it nearly choked me to death with their dryness, it is also the task given to us children to beat a huge bowl of eggs and sugar with a springy whisk and it was a chore, it took ages to get the eggs fluffy. 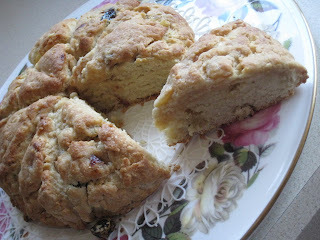 Now, it is a different story, having not ate these cakes for awhile, makes me yearn for some. A Kuih Bahulu mould is needed and without it, have to improvise. I have these cast-iron moulds of Alphabets and Animals and gave it a go. They turned out pretty good. Whisk eggs and sugar in a stand mixer(no more springy whisk) until light and fluffy. Sieve flour, cornstarch/tapioca starch and baking powder and add 1/3 in to the egg mixture. Fold in lightly and repeat until all the flour is added in. Remember to fold in lightly as not to deflate the egg mixture. 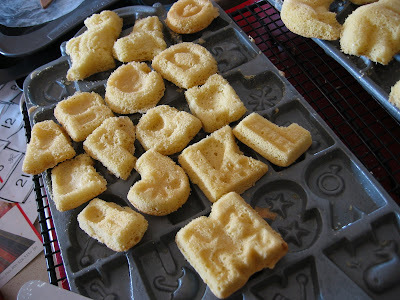 Grease moulds and fill with batter. Bake for 8 on preheated oven at 375F . Fish is my lifesaver for our dinner menu but unfornately we are not blessed with fresh fish, being thousands miles away from the coasts. Trouts and salmons are the only ones sold in the supermarkets as fresh. In the asian markets, pink tilapias are swimming in the tanks, the rest are frozen. I like to buy frozen fish as i find them to be still good when thawed, the ones which are sitting on ice and looked fresh are actually defrosted. Sprinkle salt and pepper on to the salmon before frying. Heat oil and then lower the salmon fillet/steak into the oil carefully. Fry until it is brown before flipping. Fry the other side of fish until brown. Dish out and drain on kitchen towel. Remove the oil from the pan and wipe pan clean with kitchen towel. Add in 1 tsp oil, soya sauce , sugar and 2 - 3 tbsp water. Cook until sugar is dissolved and sauce has thickened. Spoon sauce over fried salmon and then top with fried kai lan. 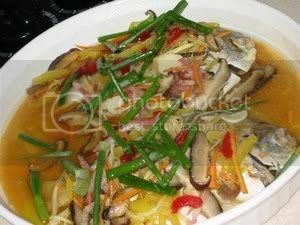 A traditional Sichuanese noodle dish that used to be a common street food acording to Wiki. Dan Dan Noodles are named after the bamboo shoulder pole (dan) that the street vendors used to carry their stoves, noodles, and secret sauces. There's no one original "dan dan noodles," and below is my version of it. 1. Heat 4 tbsp vegetable oil in wok, then add the Sichuan peppercorns and fry till fragrant, about 1 min. Discard the peppercorns, leaving the oil in the wok. Add the pork, char choy, ginger and garlic and fry, breaking up the meat. Add the soy sauce, bean paste, salt and pepper to taste. 2. Bring a large pot of water to the boil. Drop 1/2 the noodles in, and quickly stir with chopsticks to separate the strands. When it boils again, stir it for 30 seconds and add in a cup of cold water, when the water comes back to the boil, stir and remove the noodles and dunk in cold water , to stop the cooking. Bring the water back into a boil and repeat with the other half of the noodles. Put cold noodles into a bowl and nuke in the microwave for 1 minute. Top with some meat and the garnishes. You will not believe that this rommaine costed only 79 cents and it was so huge and the leaves so crispy and sweet. 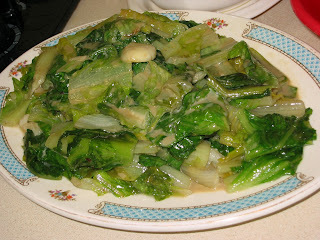 Two pieces of fu yee made a very flavorful sauce and together with the crushed garlic, this dish is delectable. Heat oil and add in fu yee. Mash fu yee and saute until fragrant. Add in crushed garlic and when garlic is golden brown, add in the rommaine. Fry until rommaine is wilted, add in a dash of fish sauce. I remembered that this dish is called Sothy but everytime i asked my indian friends, they seemed to blink and i feel silly for asking. So, everytime i make this dish, i will say it is coconut milk curry and would not dare to say that it is called Sothy. I was very delighted, when i searched in the net and found this statement "Kiri hodi: a Sri Lankan curry sauce, made with coconut milk, onions andturmeric. Also called pol kiri and sothy. Kiri is a Sri Lankan word for coconut." The blink i get must be from indians who are not Sri Lankan. Put all the ingredients to cook and the dish is done when the fish steaks are cooked. Adjust the taste with salt and lime juice. Serve with fried shallots and cilantro. This is something new to me when belacan is concerned. To me, belacan is for Sambal only and thanks to great cooks who are so innovative to come up with new flavors like this, adding belacan powder into a flour which is used for coating meat for deep frying. This belacan flavored flour mix must be very popular as there are so many brands to choose from. I was given at least 3 brands and all of them are pretty good, the belacan is quite mild and for the brave, do add in more belacan and chilly to move this dish to another level. Season the pork pieces with the belacan powder mix for 30 minutes. Add oyster sauce and sesame oil. Mix well. 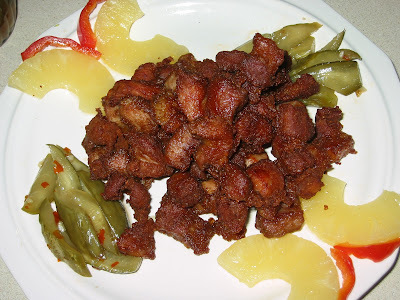 Deep fry pork pieces until golden brown. Yesterday we had our first frost of the season. The snow might have come early morning as when i woke up, i was greeted with snow covered everything and it must be heavy and wet, cos it broke the trellis of my clematis. Well, this was expected and when it shopped snowing, time to shovel the driveway - what a chore? How i wish i was in Malaysia then? To compensate and soothe my homesickness for the tropics, i cooked this Laksa Lemak. I have not eaten this before and only knew about it when a May Leng, went home to Penang and send me a few packets. Thank you May Leng for introducing me to this Laksa. Without your kindness, i would never have known that Hup Loong has such a delicious product. Boil thick noodles in a large pot of water until soft. Drain and run through cold water to remove the starch. Drain well. Fry the laksa lemak spices and ground onions with cooking oil. When the flavor is detected, add in the water and cook for 30 minutes. Add in coconut milk , mashed sardines and tuna. Bring mixture back to the boil and adjust taste with salt and a dash of fish sauce. if desired, add in a little lime juice. Put noodles at the bottom of a big bowl and spoon hot gravy over it. Top with all the garnishings and enjoy with sambal belacan and a squeeze from the lime wedge. This Acar is unique as it is made with 'Buah' in Malay, meaning fruit. All sorts of dried fruits can be used and the aroma of the sambal with the dried fruits create a special lingering fragrance that enlivens the tastebuds. This effect must have come from the 'kum cho/liquorice' in the dried fruits. This is an easy dish to prepare if you do not have to make the sambal from scratch. All you readers should know me by now, shortcut way is the way to go. Look into your pantry/freezer for a packet of sambal/premix, it could be for Assam Fish/Seafood, better still, sambal tumis and you are set to make this Acar. Heat cooking oil and add in the sambal tumis. Saute until fragrant. Add in the fruits and vinegar. Cook until well combined. When cooled, put acar into clean jars. Acar goes very well with fragrant rice. Try it as a topping for bread, spread some to your burgers, be adventurous with it, there is endless possiblilties with this. 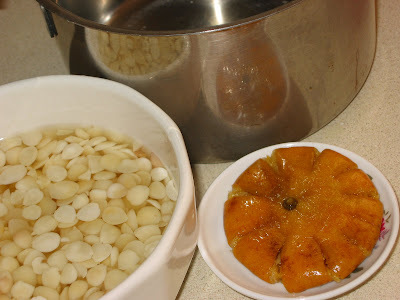 if the dried fruits are too dried, cook them with water and a pinch of baking soda. There are two forms of the plant, one (often with white flowers) producing sweet almonds, and the other (often with pink flowers) producing bitter almonds. The kernel of the former contains a fixed oil and emulsion. Bitter almond (Pak Hung) should not be confused with "sweet almond." Sweet almond seeds do not contain amygdalin and can be eaten, whereas bitter almonds can be toxic. The poisonous hydrocyanic acid contained in bitter almonds breaks down when heated, so the poison is unlikely to accumulate when used in any cooked dish. It is unwise to eat raw bitter almonds. Serious almond poisoning is rare in adults, but children may die after eating just a few bitter almonds. China sweet almond (Lum Hung) is tested, it's physical item and chemical essential are same as American almond. Just their appearance shapes are different. This sweet soup is recommended to relieve a bad cough. Put all the ingredients in a saucepan and bring it to the boil. Lower the heat and simmer until the kat paeng is soft. Discard the kat paeng and take the drink with the almonds warm. Heat the pan and grease the holes. Keep the heat at medium. Pour enough batter to fill the holes. Not filling the cups completely full is suggested to getting them to turn easier- remember, they will expand slightly as they cook! 3/4th full is about right. Lift the batter by 1/3 to one side, continue this procedure for all the other holes. Then come back to the first hole and lift the batter to more than 1/2, repeat procedure with the other holes. Finally, flip the batter in the first hole and the rest. The batter has become a ball now and flip the balls over for even cooking. As i have mentioned so many times that my grand daughter, Renee, is such a picky eater but she ate this at a friend's house, which nearly made me fall off the chair. Although this is not very healthy as they are fried, she likes it and that's what counts. Marinate the shrimp with 2 tsp salt and 2 tsp tapioca starch. Knead it in and leave aside for at least 1/2 hour. Wash away the salt and tapioca well and keep the shrimp under cold running water until water is clear. Drain and wipe the shrimp until really really dry. Add in seasonings and dust with all purpose flour. Shake away access flour. 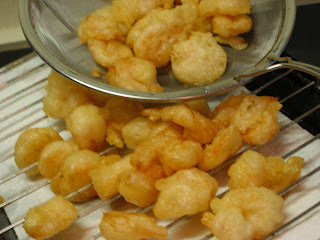 Heat oil until 350 f. Dip floured shrimp into batter and fry until golden brown. Do not crowd, fry shrimps in batches. 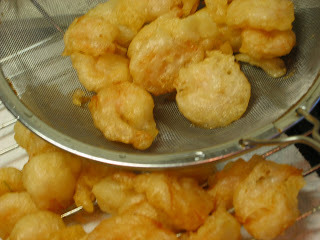 Remove from oil and let fried shrimps drain on a lined cake rack. Serve warm with Sauces of your choice - Renee is with tomato ketchup. It is still the same old watermelon. We ate, made drinks and floats with the flesh and then made pickle with the rind and now a warm sweet drink with the rind. Nothing to throw away so no cause to complain. Put watermelon rind in a big pot and enough water to cover the rinds. Bring to the boil, then reduce heat and let it simmer for at least 1 hour. Add rock sugar according to your taste. Stir until the rock sugar dissolve. 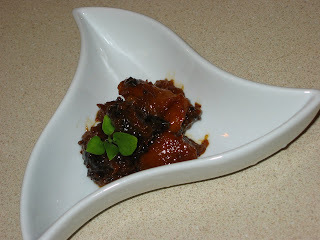 As promised, the recipe for Pickled Watermelon is below. I have always grumbled and said that it is such a waste to get rid of the rind but i do not grumble anymore when our friend, robyn told me that her dad will make a pickle with the rind of the watermelon. 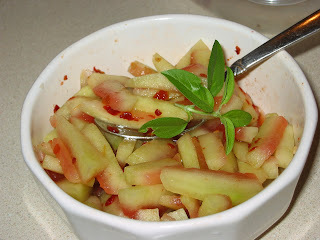 So everytime, we have watermelon, the rind will be made into pickle and a very delightful sweet drink. Look out the the sweet drink recipe tomorrow. Sprinkle salt and leave aside for 30 minutes. Leave to marinate for at least 1 hour before serving. Fresh watermelon may be eaten in a variety of ways and is also often used to flavor summer drinks and smoothies. Watermelon contains about six percent sugar by weight, the rest being mostly water. As with many other fruits, it is a source of Vitamin C. It is not a significant source of other vitamins and minerals unless one eats several kilograms per day. Watermelon seeds are rich in fat and protein and are widely eaten as a snack.especially in China, competing with sunflower seeds. Watermelon rinds are also edible, and sometimes used as a vegetable. In China, they are stir- fried, stewed, or more often pickled. When stir-fried or pickled, the skin and fruit has to be removed using. Look out for the Watermelon Pickle recipe tomorrow. Blend ice cubes with watermelon flesh. Add in a squeeze of fresh lime into the watermelon drink. For Watermelon Float, top drink with a scoop or two of ice cream. This Pandan Kaya Fudge Cake was a rave in Malaysia in 90's and i don't know if it is still a star attraction in the bakeries. This tropical harmony of coconut and agar agar makes this a sweet treat that tastes like jello but cuts like a cake. This cake will cause oohs and aahs the minute it is presented and will immediately bring smiles on the first bite. Heat water and oil in a microwaveable jug for 1 minute, then pour into the sifted ingredients. mix well until the mixture is smooth and consistent. Separate eggs and mix the yolks into the above batter. Whip egg whites and cream of tartar of Ingredients B at medium speed until the egg whites are bubbly. Add sugar and whip at medium high speed until stiff form but not dry. Fold 1/3 of whipped egg whites into mixture of flour and yolks batter Then, pour this mixture to the remaining egg whites. Fold lightly to combine both mixtures. Bake at a preheated over at 300 deg F for 45 - 50 minutes. When the cake is completely cool, run a knife around the sides of pan to remove the cake. Allow the cake to cool. (1) Put all the ingredients into a pot and stir till evenly mixed. (2) Cook over medium heat till mixture thickens and smooth. Cool slightly before using. Make sure it is still in pouring consistency. 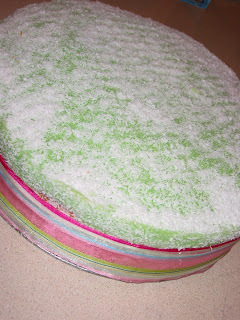 (3) Wet the cake ring and place a slice of sponge cake into a cake ring, pour in 1 1/4 cup of kaya and continue the same process till the last layer is covered with pandan kaya(use more for the last layer). Press slightly after layering the cake onto the kaya and make sure that the kaya fills the sides on the last layer. (4) Leave aside to cool and set before chilling in the fridge. 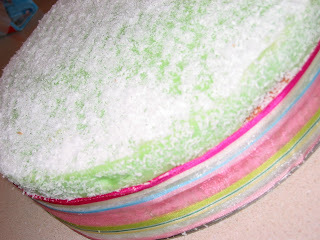 (5) Remove cake from cake ring and cover the whole cake with dessicated coconut. If you are using an ordinary cake pan, line the cake tin before putting in the first layer of cake and when removing cake, introduce air in by folding 3 or 4 strips of paper and slipped them to the side of cake. Cake will then dislodged easily.